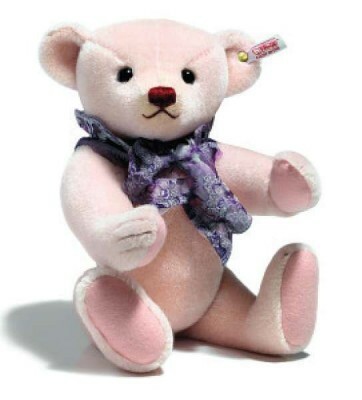 Louise is the Steiff 2013 Club Edition made from luxury pale pink alpaca with the Steiff gold plated "Button in Ear". A very elegant bear Louise is wearing a beautiful florentine scarf and is a perfect partner for the 2012 Steiff club bear Louis made for 2012. Limited to the year 2013 with gold-plated "Button in Ear". Comes complete with Steiff box and certificate.